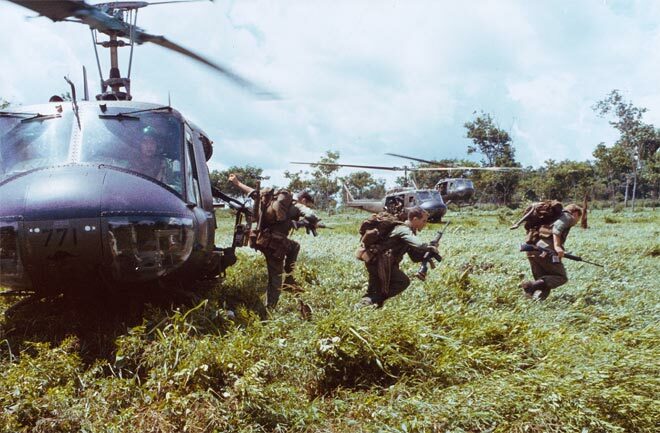 Infantrymen of the 6th RAR/NZ (ANZAC) Battalion alight from helicopters at a landing zone in Vietnam in August 1969. New Zealanders and Australians fought side by side in Vietnam. The New Zealand infantry companies formed a battalion with companies of the Royal Australian Regiment (RAR). New Zealand's 161st Battery also routinely provided artillery support to Australian units. For most of the war the artillery and infantry units were based at Nui Dat, the Australian base in Phuoc Tuy province, south-east of Saigon.